Guinea pigs are prone to several health problems and getting bladder stones are one of them. Guinea pig bladder stones are a painful problem that can be life-threatening. Once you know your pig has bladder stones they should not be ignored. Uroliths are also commonly referred to as bladder stones. Bladder stones in guinea pigs can be big or small and can stay in the bladder or get stuck in the urethra. Sometimes stones are so small that they can be passed when your guinea pig urinates but more often than not they either get stuck in the urethra (where the urine exits the body) or cause irritation to the bladder tissue. Uroliths are painful, can cause bloody urine, or even prevent a guinea pig from being able to urinate if they get stuck. They are basically small stones that if unable to be urinated out, need to be surgically removed. How Do Guinea Pigs Get Uroliths? The pH of urine can change and when it does it can form crystals inside the bladder by using minerals and proteins within the urine. These crystals can eventually accumulate and form one or many stones, or uroliths. Diet and water intake may play a role in bladder stone formation, but just like in people, we don't know 100% of the time what causes guinea pig bladder stones to form. Can I Prevent Bladder Stones? Since we don't know what exactly causes bladder stones it is difficult to say how to prevent them. You can start by making sure your guinea pig diet is the best it can be, offer clean water and make sure your cavy is drinking it (since we do know that more dilute urine has a less likely chance of forming stones), and get your guinea pig spayed or neutered. How Do I Know If My Guinea Pig Has a Urolith? If your cavy is urinating blood, has a painful abdomen, or is not urinating normally or at all, your pig may have a urolith. 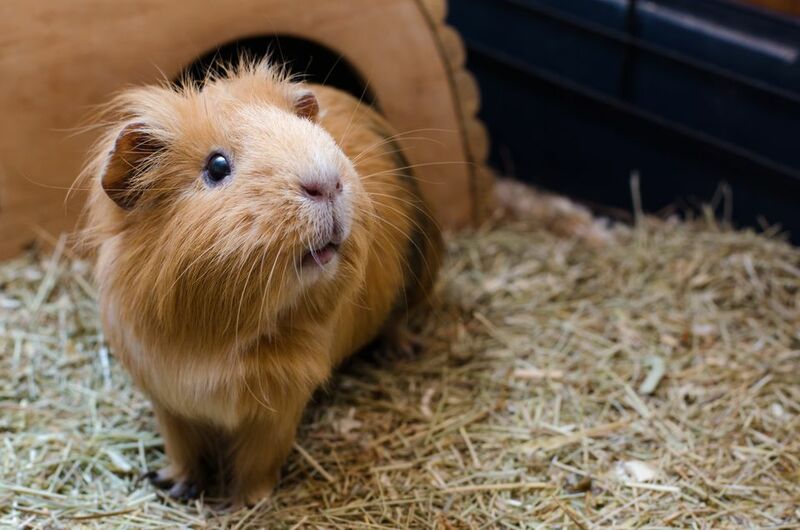 An exotics vet will be able to positively diagnose your guinea pig with bladder stones after doing a physical examination and possibly a urinalysis and/or radiographs (x-rays). If a stone is present it should show up on the radiograph and a urinalysis will tell the vet if there is an infection in the bladder, blood, or crystals that need to be treated. Never ignore anything strange that your guinea pig does. If you think something just isn't right, even if you can't put your finger on it, it is best to have your pig checked out by a vet. They are trained to find things you don't. What Do I Do If My Guinea Pig Has a Bladder Stone? Your options may vary depending on a few factors. If your cavy has one or several bladder stones in his bladder that is too large for him to urinate out surgery is your one option to save him. Even if he doesn't have an issue when the stones are discovered, he will sooner or later and is probably living in constant pain. Euthanasia is your only other option if surgery is not feasible. If there is a stone stuck in the trigone (where the bladder turns into the urethra) or the urethra your vet may try to remove it under sedation or try to push it back up into the bladder by using a catheter so that your guinea pig can at least urinate for the time being or before going to surgery. Sometimes the stone tears the urethra and urine cannot exit the body. This is a bad situation called uroabdomen where the urine backs up and goes into the abdomen of the guinea pig. Euthanasia should be elected at this point as there is no real way to find where all the tears in the bladder or urethra are. If the stones are really small your vet may have you increase your pig's water intake to help flush them out of his body before they are too big that he can't. Regardless of your specific bladder stone situation, guinea pigs that have stones should be kept comfortable and as stress-free as possible. If your guinea pig lives with another pig bring that pig along to the vet, offer UVB lighting during the day, and ask your vet for guinea pig specific pain medications and/or anti-inflammatories. You can help your guinea pig through this by just giving a little extra TLC. Do Guinea Pigs Go Into Heat?